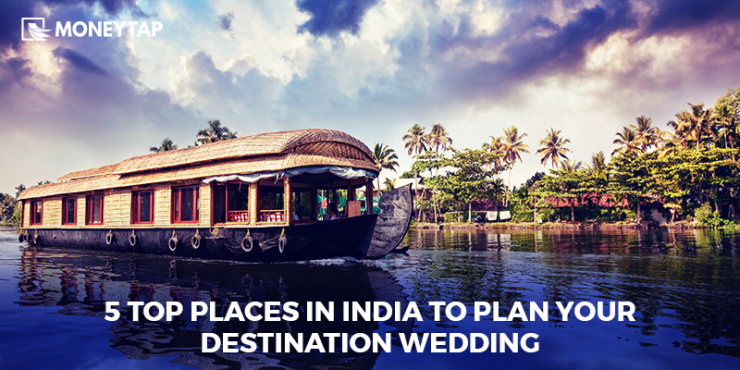 India has become one of the most popular choices for destination weddings. It offers a plethora of choices like beaches, authentic palaces, forts, scenic hilltops, temples and much more. A country of diverse customs, India has a blend of breathtaking destinations to choose from. Do you want to have a grand wedding at an exotic destination, away from the hustle and bustle of the city? Here are a few ideas to host your dream wedding. Having a wedding planner, or a hotel event planner can be of invaluable help for a destination wedding. People flock to Goa in droves to get hitched. Goa is so popular that the thought of attending it has your guests rushing to book their flight tickets. One can’t help but describe Goa with flowery words. The breathtaking sunsets, beautiful beaches, old churches, water front hotels, wine, sea food and lots of carefree fun. Words are not enough to describe what you experience in Goa. So are you ready to have your wedding at Goa, with the gentle waves of the Arabian Sea in the background? . Park Hyatt , Taj Exotica, The Leela , Alila Diwa are popular beach resorts in South Goa. For an intimate garden wedding, Turiya Villa is a favored location. Bear in mind that beach weddings require a permit, wedding planners usually arrange for one. A regal wedding comes to mind when you think of the palaces in Udaipur. If you want to marry like royalty then Udaipur is the perfect destination for you. What better than the royal House of Mewar to give you a taste of royalty. The event planners of their HRH Group of Hotels help to organize your wedding in style. The City Palace Complex combining “Shiv Niwas Palace” and “Fateh Prakash Palace” which are two of the heritage hotels, is among the top venues for weddings. Historical monuments Jagamandir Island Palace, Manek Chowk, Zanena Mahal, Mor Chowk are a few of the historical monuments, which are now available as venues for weddings. If you are looking for a unique idea and love vintage cars, the Maharana Mewar’s vintage car collection can be used as a background for your wedding. The collection includes Rolls Royce, Cadillac, Mercedes and even a car from a James Bond movie! The pink city of India is yet another famous place for a destination wedding. This city has hosted Bollywood and Hollywood celebrity weddings, and is known for its grandiose wedding celebrations. The city has a mélange of wedding venues available. Authentic Palaces such as the Raj Palace Grand Heritage Hotel, Jai Mahal Palace and Rambagh Palace are few hotels suitable for weddings. Samode Palace (Link to: http://www.samode.com/) offers a beautiful traditional setting, built into the Aravali ranges, and is an hour away from Udaipur. For those interested in quaint ceremonies, mansions such as Alsisar Haveli and Mandawar Haveli are popular choices. These havelis are not only beautiful, but cost effective as well. Neemrana Fort Palace (Link to: http://fort-palace.neemranahotels.com/), a couple of hours’ drive from Jaipur, is so unique that it warrants an independent entry in our list. This ancient fort has a shock-and-awe effect with its magnificent architecture and breathtaking view. It is an ideal location for photography and offers a striking backdrop for the bride and groom to capture their many lovely moments in this scenic palace hotel. This place is marked with a lot of historical memories. Neemrana’s first royal wedding, which was a London-Singapore affair dates back to 1992, with guests arriving in a chartered plane. The hotel offers a roman amphitheatre which seats 200 people, hanging gardens, Ucha Bagh and other locations for day and night functions. The arrangements made by the hotel is said to be impeccable, and they are known for their ambience and hospitality. Destination wedding is still an evolving concept in the serene backwaters of Kerala. It is idyllic for those who desire a quiet, offbeat and picturesque ceremony. The backwaters of Kerala with their lovely house boats and beaches covered with coconut palm trees make for a scenic location. ‘God’s own country’ has a variety of places to choose from. You can tie the knot in Kovalam beach, the tea gardens of Munnar, the heritage building of Kochi fort or Allepey. There are a number of resorts that cater to such weddings. The beachside Leela Kovalam (Link to: https://www.theleela.com/en_us/hotels-in-kovalam/the-leela-kovalam-hotel/) and the luxurious Zuri Kumarakom (Link to: http://www.thezurihotels.com/kumarakom/rooms-suites.php) near Allepey are the top favourites. A few other options are the Kumarakom Lake Resort, Kadavu Resort, Lake Palace Resort, Lakesong Resort, Indriya Beach resort and Carnoustie Beach Resort. Who doesn’t wish for a beautiful wedding? Choosing a suitable destination can make your wedding day special and memorable for you and your guests. Explore wedding loan from MoneyTap and tide over those worries.